Today I’ll be explaining how to increase your websites adsense earnings using a few simple methods I’ve picked up over the years. Yesterday as I was checking my stats, as I do everyday. I noticed my adsense earnings were looking pretty good and slightly higher than my average days adsense earnings. Here’s a screen shot I’ve taken this morning showing yesterdays performance. 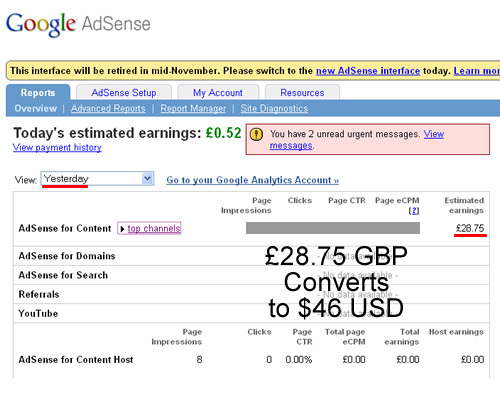 It shows that yesterday from Adsense only I made £28.75 which converts to just over $46 USD, not bad! I’ve actually had many days that have produced higher earnings but that’s not really the point I’m trying to get at here, adsense for me is all about building a passive income. I didn’t have to work for the money that I earned yesterday. Its a regular & recurring income from the work I did weeks, months or even years ago in some cases. Adsense is great because it allows you to work when you want and when your up and running it will provide a income for years. Imagine this for a second: Getting paid for work you did a year ago! Adsense is powerful and I highly recommend you put it to use. There are three factors that can be changed to effect your adsense earnings. An impression is recorded when a person sees one of your adsense adverts. You can increase impressions by increasing the amount unique visitors to your website. Providing lots of valuable content on your website topic will ensure you get lots of visitors to your website. I define valuable content as something the visitor can use, read, watch or listen too and benefit from. Build your site for people, not for Google! The second way you can increase impressions is to increase page views. If you can encourage people to visit more pages on your website the better chance of them clicking on your adsense adverts and thus making you money. Once again content is the key here is you have lots of content on your site make it easy for a person to keep on reading through your site. Display links to related topics or articles you think the person would enjoy reading or learning from. You can see an example of this tip in action the bottom of this post see “related posts” and to the right see “recent posts” these are designed to keep you on my website and keep you engaged for as long as possible. Your most likely reading this article because of the email I sent to you and this is one of the ways I follow up with my visitors. I’m sharing everything here! It’s a mutual exchange between you and the visitor as you provide content they will provide clicks. Don’t forget you get out what you put it. Your CTR will vary wildly across your pages and websites if you have more than one, I consider a good CTR to be around 3-5% but I have seen sites that will be much higher or lower on a regular basis. If your primary income source is from adsense you’ll probably need to be hitting at least 1% to make a reasonable amount of money for your time spent creating the sites content. Note that the CTR is only part of the equation it is possible to have a very low click though rate but high impressions and CPC which can provide a good income. To increase your Click Through Rate you can increase the number of Adsense blocks per page as this will increase the overall impression of the ads on your website. You can also increase the variety of Ad blocks on your web pages. Try testing different sizes and formats (links, text, image, mixed). Position is very important to your CTR and generally you will receive more clicks if your Ads are placed where the visitors eyes scan over the pages content. Side banners are less effective in most case but can significant clicks if located near navigation buttons or links to other pages. Note: Be careful where you place you Ads and how you display them! Don’t try to get clicks by misleading or misdirecting the visitor as this is against the Adsense TOS. A example of this would be a navigation menu that is in the same format and colors as a Adsense with a Ad block right next to it. Also keep your ads away from anything that says click here or download here as this can lead to problems with Google too. Another great way to increase CTR but should be noted at the expense of visitor experience and should only be used in certain scenarios. Is to create what I would describe as exit pages. Exit pages are basic pages in your website that have content but can only be exited by clicking out on your adsense ads or by using the back button. Use this tip with caution and only on your deepest pages. Thinks that covers the basics of increasing CTR. Your website content can be written to provide excellent visitor value and to increase your CPC I recommend you make use of the Google Adwords keyword tool and do some searches on your targeted keywords with the cpc column checked. You should reveal some juicy keyword phrases that you didn’t think about and then all you need to do is create the content around these new keyword phrases. 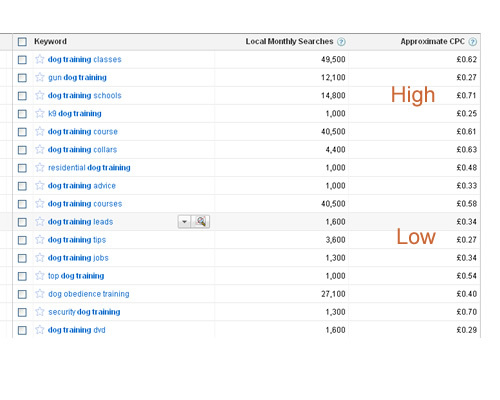 In the example above for “Dog Training” you can see the best paying keyword phrase in this section is Dog Training Schools with a cpc of £0.71 and the worst paying is Dog Training Tips with a cpc of £0.27. So assuming everything else was equal a article you written about dog training schools would pay more than your article about dog training tips. Generally big buyer markets or high ticket (high priced) items will provide higher cost per clicks, Insurance & Finacial services are examples of these high ticket / high cpc topics. It makes sense to think about the cpc rate before you create your next piece of content. The second big factor in your cpc pay rate is your visitors demographic / social group & location because when advertisers put their ads on the content network they have the option to choose who their ads will be displayed to. Many advertisers will selectivlely choose which people best match with their product. An example of this would be High street fashion shop and they would most likely target women aged 18-50 located within 50 miles of their shop. Design your website for your visitors but be aware of your demographics, you could be going into a market that does not attract cash rich advertisers. This problem is common for lots of gaming & social media sites as they attract lots of young people but then have difficulty in getting advertisers interested in buying the available adspace. Unless of course the advertiser is also into the gaming market and even if they are the cpc will probably be very low. Test your content and check your cpc with different types visitors because every website and market is different. Use Google analytics to check your visitor demographics or try using alexa.com for checking on other peoples websites. I hope you enjoyed reading this article and that you put these tips into practice, I’m confident that these few small changes will increase your websites Adsense revenue. If you would like to learn more please check out some of these adsense guides that I have personally used to help increase earnings on my own websites. Please feel free to comment below and share your tips, thoughts or suggestions on this topic. I just want to know how you can increase traffic to your adsense site. My site is rank OK, but traffic really low. Great post, this has inspired me to stick with google adsense. great post by studing your article now i have improve very mush earning process thanks for sharing. great post from this i have improve my adsense earning thanks for sharing such a great knowledge. Nice post i wish i could own website all to myself and make some earnings from adsense. Please tell me how can get google adsense accounte. Thanks, good post on Adsense earning……. I liked your way of describing the things to the readers. Thank you for the advice on adsense, I will try to put them to good use. I have focused mostly on my blog but will try to use better on website as well. I have started writing a technical blog. Is there any criteria like number of visitors or pages of the blog to get approved our Adsense account? Thanks for sharing tips very helpful post. Wow,i’ve been running my website for more than a year now without thinking that earning this amount is possible.but from your screenshot,it means that it’s real.i’ve set a goal.thanks.